This is the online diary I kept during my first visit to Mysore to study with Pattabhi Jois in the winter of 2001-2002. I’ve kept journals on a regular basis before but never online, and when I started this one the intended audience was still mainly myself plus a few friends and online acquaintances. After a couple of months, though, people I had met in Mysore and people arriving started to mention that they were reading it; friends who had left Mysore said yoga students in other places were reading it; I started getting emails from strangers who were reading it. So from about early January onwards, I was much more conscious of writing for a wider audience. Whether that actually changed what I was saying or not I don’t know. Anybody who chooses to read that far can judge for themself. After I came home in March I rearranged the entries to read in chronological order from the beginning, which makes more sense for reading after the event. I’ve also (as at 10th April) started adding some pictures. I haven’t touched the actual text except to correct spelling mistakes. Munich to Mysore in under 24 hours. Frankfurt to Mumbai (Bombay) flight was painless and almost pleasant – surprisingly good Indian vegetarian food, well done Lufthansa, and a Hindi musical (English subtitles) which astonished me by actually having *acting* and a *plot* as well as the usual naff musical interludes. I’ve never seen a whole one before – maybe they’re all like that. It would certainly stand comparison with most of the mindless pap that comes out of Hollywood these days. So then I was in Bangalore, about eight in the morning local time, and some time in the middle of the night inside my mind. Booked a taxi to the station, but then couldn’t face dealing with Indian railway station crowds in a state of exhaustion with big luggage (Am travelling with a suitcase instead of a backpack for the first time in my life. Am unsure what this does to my self-image as a rugged independent traveller – good chance to practice non-attachment to self-images) … so let the taxi driver talk me into going to Mysore in the taxi instead. Can worry about budget later when I’ve had some sleep and my body knows what country it’s in. 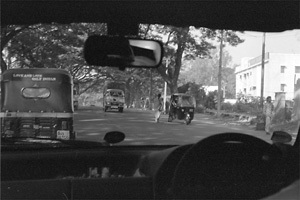 Strangely fun journey – Indian rules of the road are not as chaotic as they look, my taxi driver was a master of them and I remembered some of how it works from the last time I was out and about on an Enfield in Kerala. So got into the mood and decided to take some atmospheric photojournalist-type moving traffic shots. Loaded up a roll of b&w, took about three frames … and woke up fifty kilometers later out in the country with the camera in my lap. Oh well, another time. Guruji says in March when there were over a hundred students, he was starting at four and working through until about two in the afternoon, not bothering to go home before 5 o’clock conference, and then just briefly going home in the evening before another four o’clock start the next morning. One night he didn’t even bother going home. Pretty impressive level of energy and motivation for a man of his age (to say the least). But I hope it won’t get like that again this year – guess it probably will, more people arriving every day – so then I hope by the time it does get like that again in February, I’ll have been around long enough, or have made enough progress, to hang on to my precious 6:30 slot. Spend some of my waiting time sitting on the stairs watching the other students practice. Tremendous energy in this legendary little room and everybody’s practice looks beautiful. (Haven’t actually watched people practice, when I wasn’t practicing myself, for quite a while) And some of the time thinking how great a wide angle photo through the grill would look, but how completely too dark it is and would definitely need flash which would be incredibly rude and completely out of the question … but if it *wasn’t* out of the question, then the way to do it would be to photograph through the grille but with an accomplice holding the flash in the doorway …. but it is. Woo hoo! Sharath got me into Marichyasana D today. Only one side, but even so – I thought that would take at least a month. Apart from that, today was the day jetlag caught up, and my body decided to protest about the fact that we’re not in Germany any more by spending most of the day snoozing apart from a brief, hot, noisy lunchtime venture into town. The only pleasant bit of which was a slightly surreal lunch in a restaurant where the food was excellent but quite expensive, and I was the only customer who wasn’t a Tibetan monk. And dusk on the roof of the Hotel Kavery – another surreal scene as hundreds of large bats materialised out of the haze around the nearly full moon and flew slowly westwards over town, in a scene not wholly unreminiscent of the flying monkeys in the Wizard of Oz. So all in all, a good start to a bit of a weird day. (I think it’s Thursday 1st November. If I wasn’t writing this diary I don’t think I would feel any particular need to know. And that wouldn’t necessarily be a bad thing). Moon day today. Got up at practice time anyway because I wanted some street photos in the dawn light. There are a couple of weathered wooden doors down the road from the Kaveri Lodge that fascinate me, and will be a project while I’m here until I have them in every possible light, in colour and black & white. Also what I hope will be some atmospheric shots of the road by the park, on the way from Kaveri Lodge to the Shala – trees hanging over the road in early morning mist. Apart from the Sharath Marichy D Incident on Tuesday, the score of things done in practice here that I haven’t done before is two: binding my right foot without assistance in ardha baddha padma paschimottanasana; and the proper lift and jump back from marichy a where the knee stays behind the shoulder (have never been taught that one, but saw a guy doing it at Pattabhi Jois’ workshop last year in NY and thought “that looks cool”). Attributable to some combination of: the Indian climate; the accumulated prana buildup in the shala; and the “oh my god, that’s Pattabhi Jois watching me” factor. nauli definitely dangerous for women. Full udhiyana bandha is ok, but no churning. Guruji is doing Puja (sp?) for his wife from 8th January, shala will be closed for about 2 weeks. Sharath’s baby is also due round about then. I think I’ll just go down to Kovalam while the shala is closed, not for the whole month, so as to hang on to my 6:30 practice slot and not end up at the back of the queue in February. WONDERFUL sitar/tabla performance this evening in the Mysore Mandala – new gallery / performance space just across Double Tank Rd from the shala. Beautiful room. No socialising afterwards – everybody just ups and leaves. Which is a pity. But 9 o’clock is pretty late for Mysore folks, even on a Friday. “Mad dogs and Englishmen go out in the mid-day sun” … to the Southern Star pool, and get burned despite using factor 10 suncream (clearly not strong enough, or didn’t use enough of it) and spend the rest of the afternoon lying in their rooms feeling sick. I hope it’s only sunburn. Time to start using up my tiny supply of grapefruit seed oil, though, just in case it’s the nasty stomach-headache-fever bug that seems to be laying everybody low for a week. No headache though, and only slightly nauseous, but very weak and don’t want to eat. Maybe go next door to Harini’s and see if I can deal with some porridge. Wish I’d bought a bigger bottle of grapefruit seed oil. Was ill last night, and didn’t go to practice this morning. Feeling ok now though. I’ve now found the place with the DSL connection – Dishnet, out in the ’burbs in Saraswatipuram near where Venkatesh teaches. It is really fast *and* ftp works, so I can now put this diary on a web page of its own and maintain it easily. There’s a good cafe downstairs too – juices and Indian sweets. Bliss! Tough practice today – typical Day Five practice, even though I was ill on Sunday and didn’t practice so it’s actually only Day Four. Sharath has been putting me in Marichy D both sides all week, and yesterday let me go on to bhujapidasana. Feel nearly ready to do marichy d right side on my own – nowhere near on the left. But my right inner thigh is hurting so much from all the opening, walking home from practice is getting to be quite a challenge. Not because Sharath is doing anything clumsy or excessive – far from it, his adjustments are great – powerful but careful. It’s just that I’m working so hard to get my right side padmasana (old knee injury) to open up. Sometimes life revolves around fluids, various, into and out of and around the body. This morning I woke up with a cold, so did saltwater neti to clear my nose, and gargled with saltwater and grapefruit seed oil to fix the sore throat. Then off to practice to sweat a litre or two. Afterwards a coconut to replenish the sweat, back to the hotel for a lie-down, then pineapple juice with ginger for breakfast – ginger for heat to help with the cold. Auntie’s allegedly magic cold-curing rasam at lunchtime. And all in the name of accumulating prana. The cold is a pain, hope it won’t last long. The stomach upset at the weekend was over in a day. Out of town for the weekend, at the Tibetan Monastery & University at Sera Je. Nice to be somewhere where you can breathe the air, but this is a weird place. I’m highly unconvinced that enlightenment is something that can be drilled into adolescent boys by rote learning, no matter how much you shut them away from normal society and dress them up in uniforms. (As the product of an English boys’ grammar school, I do have some knowledge of what I’m talking about here). And Tibetan food is awful. None of which, of course, has any bearing on Tibet’s unconditional right not to be invaded and subjected to cultural genocide by the evil and vicious Chinese regime. And a religious tradition that can produce a man like the current Dalai Lama is clearly doing something right. Also nice to spend enough time with people to be able to have some real conversations instead of all the usual amiable Mysore cafe trivia – where are you from how long have you practiced how long are you here is this your first time where are you staying …? Travelling with a big bag of expensive fragile cameras – 2 bodies, 5 lenses and about 50 rolls of film – is a perfect reminder of the burden of attachment to material things. Constant worries – theft, heat & x-rays hurting the film, am I using the right camera/lens/film for what I want to do? Am I actually getting noticeably better results than I would with just one camera and a decent zoom lens? Time will tell. Raymond Depardon travelled the world getting pictures a thousand times better than I ever will, with just a Leica and one or two lenses. Opening Time, or, The Day I Tore My Foot Off. Was going into left side Marichy D this morning, assisted by Sharath, when there was a most horrible crunching / ripping / tearing from my right ankle. Very scary – no pain, though. I thought I must have torn something badly, and tried standing on it. No problem. Sharath sat me back down and got me to ease it into half lotus. No problem. An Opening – some kind of scarring or knotting from my old knee injury, coming un-knotted. Sharath says this has happened to him at least four times, and it will hurt tomorrow. Thanks Sharath. Just as well, then, that tomorrow is a practice holiday for Diwali. And Thursday is New Moon, so my poor right leg gets to have a rest before it completely disintegrates. The soreness in the thigh is getting steadily worse, and now we have a not-hurting-yet ankle too. Off to the ayurvedic pharmacy for a large bottle of pain-relieving oil. Happy Diwali. My right ankle has produced a blueish swelling about the size of a tennis ball, but stubbornly continues not to hurt. Am invited by some Swiss folks I met in a restaurant to share a car to go and look at the 12th century temples in Belur and Halebid. An interesting outing – Lonely Planet South India describes these as glories of Hindu architecture, rivalling the best of European gothic. Hmm. Maybe. Not really to my taste, and it depends what you mean by “architecture”. The temples are squat, bunker-like structures with, to my European eyes, no particular beauty of proportion and certainly none of that wonderful gothic sense of light and space – interiors are low and gloomy. What is amazing about them is the sculpture – the entire exteriors are covered with the most wonderfully intricate, lively and well-preserved little sculptures – hundreds and hundreds of tiny elephants, all beautifully carved and all different, as the bottom tier around the base of each building, several tiers of other kinds of animal and human figures above them rising up to a top tier of fantastically intricate carvings of gods. All in immaculate condition – not eaten away like European cathedrals by a couple of centuries of acid rain. And peaceful – very few western tourists and not all that many Indians, very few touts and sellers, and the guides seem to be genuinely knowledgeable and helpful. A three rolls of film day, but pictures highly unlikely to be on the web before I’m back in Europe in the spring. Also a chance to spend a day speaking German which is fun – keeps me in practice, and alleviates the constant sense of guilt about hanging out in Mysore with Finnish and Spanish yoga students and hardly speaking a word of their languages, so they have to speak English to me the whole time. 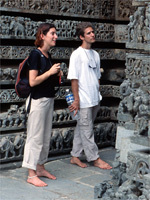 Peter and Anna, a young couple from Zurich, are travelling for a few weeks before they go to spend six months teaching at a school in Tamil Nadu and Sandra, French Swiss, previously spent some time teaching English to a monk at Sera Je. A German friend of mine spent some time last year teaching English in rural India too – not sure I would presume to go halfway around the world to teach anybody German, even if there was any demand for it. It’s really too far to go in a day from Mysore though – twelve hour round trip, most of it sitting in the car. I enjoy sitting watching the Indian countryside go by, but the last bit of the journey back after dark is hellish – suddenly loads of traffic and horrible clouds of dust and diesel smoke. New Moon – another practice holiday. Go out of town in the afternoon for a walk by the river – very beautiful, rice fields and palm trees, amazing birdlife. Must come back some time at sunset for photos. And a sign of hope for the world – a young muslim girl, in full burka, out for a walk with her hindu boyfriend. Speaks no English but, with the boyfriend translating, is quite willing to talk to foreigners although embarrassed and giggles a lot. They say they want to get married but no, their parents don’t know yet and she is only sixteen – eighteen is the legal age for marriage in India. I wish them the best of luck. Radha from Crete arrived today. I had assumed that somebody like her who has known Guruji for years would automatically get an early practice slot but no, she gets to wait at the top of the stairs at 8 o’clock like all the other new arrivals. Guruji’s system is very fair. Quite a good practice except that my right ankle, though not swollen any more, absolutely refuses to be subjected to any strain in half padmasana. I respect its wishes, and am still glad that tomorrow is another rest day. Asana demo at the Mandala by Mr. Sheshadri, a senior student of BNS Iyengar who teaches there, and has also studied a bit with Pattabhi Jois and BKS Iyengar. Interesting – none of the impressive high, floating handstand vinyasas that senior western ashtangis tend to do in demonstrations, but very intense breathing and very flexible. Some spectacular-looking asana variations, e.g. head behind the front leg in vatyanasana, forward bend in yoga dandasana. Diwali celebrations this evening – wild. Fireworks going off all over town, great atmosphere – far better than big, organised western-style public displays. Spent an hour on the hotel roof watching, listening, dodging the odd near miss from rockets. The hotel boys wanted to borrow my scooter for an “emergency” trip to the shops, won’t say what for – turns out later the “emergency” was that they had run out of fireworks. Padmasana should be tight (knees in close) when doing badha padmasana / yoga mudra, knees wider for the rest of finishing. Chin on floor and nasagrai (nose) drishti in yoga mudra; also in supta kurmasana so that the legs don’t slip off, as they could with the forehead on the floor. Was talking (again) about how he got too busy earlier in the year – teaching from 4:30 in the morning until 3 o’clock in the afternoon without a break. Might start limiting numbers, or turning away people who show up unannounced, until the new shala opens. New shala will be ready in June/July. Then he will teach separate primary / intermediate / advanced classes instead of the current mixed system. [Very glad that I’m here in time to experience the old system]. Classes will still be Mysore style, except for led primary class on Fridays, because Guruji says people “forget” to follow the correct vinyasa counting system if they always do Mysore style. Settling in. I’ve been here three weeks now, and the initial getting used to it / jetlag / holiday feeling is over. Have never been away from work for more than three or four weeks before – any other trip I’ve ever been on, I’d be winding down, getting ready to go home now. Not having to do that feels great. Might be moving out of the hotel and into an apartment on Wednesday – a particularly important piece of settling in. Did my first non-yoga class today (cookery) – have thought about doing all kinds of things, but up until now have been having a holiday and thinking about doing things mañana. Now have actually started doing doing them. Am sleeping properly again, didn’t for the first couple of weeks, I suppose partly because I’m over the jetlag, partly because the nights are cooler since the heavy rain last week. Got a scooter on Thursday, so I can buzz about town whenever and wherever I want to without the mental stress of haggling with rickshaw drivers (or being crashed by drunk rickshaw drivers, as happened last week to an English guy who is here studying with BNS Iyengar). I’m no longer carrying a camera (or two) with me everywhere I go. Took my first ten rolls of film to a lab in Bangalore on Saturday, supposedly one of the best professional labs in south India, am picking them up tomorrow. Hope I’ve got some decent pics but if not I have plenty more time and can try again. Wonderful. Bangalore and back in a day is hard work, and especially stressful and scary if you end up on the road coming back after dark – not good if you have yoga practice early the next morning, but it’s suffering in the name of art so only right & proper. 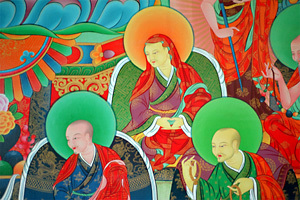 My practice has settled down too after the intial burst of enthusiasm and openings. Still steady progress – bound my hands unassisted in supta kurmasana today, have never done that before … but haven’t done right side marichy d without help from Sharath yet, and can’t seriously attempt left side this week because of the ankle. But slowly, all is coming. I’d like to complete primary series here on this visit – should be possible by February. Actually, that’s something I notice about my attitude here – I’m more driven by ambition, by working towards wanting to complete the series – less meditative, less accepting of where I am than when I’m practicing at home. Possibly not good, and I don’t think it’s just me – there’s a whole Mysore ashtanga thing of “get” the next posture, “get” the next series. Different reactions to it – I know of a couple of people who don’t like it and are leaving early, and some who intended to come for a month and have decided to stay longer. Moved out of the Kavery Lodge hotel into in apartment in the Sankalp building, sharing with another yoga student Christina from New York. Excellent. We have a less than two minute commute to the shala in the morning. We have big north facing balcony windows on the the third floor, with cool breeze in the afternoon and lots of light. We have a kitchen and can invite people round for chai and meals. We have a fridge (rented, 750 rupees a month and worth every penny). We have three light bulbs which we move around from room to room as needed, but will definitely get round to buying some more one day. I have permission from Christina to put my photos up in the living room; she has permission from me to have a tacky Ganesha by the door, with a gold frame and christmas tree lights. Kavery Lodge was ok – friendly, good place to meet people – but this is infinitely better. Trip out to the Jain holy site at Sravanabelagola. Huge statue & temples on top of a couple of small granite hills either side of a village. Have decided that I’m not really a big temple connoisseur, but the scenery is beautiful. Have to walk up the hills barefoot because they are holy – I love feeling the granite under my feet. There are hordes of army cadets at Sravanabelagola. I am puzzled. How can Jains – of all religions the one most dedicated to ahimsa, non-violence – be in the army? Turns out they aren’t Jains. Hardly any of the Indians I talk to all day are. Hindus, Sikhs, Muslims, Christians – tourists like me. Did Marichy D unassisted (pretty much – got fingertip contact before Sharath came and helped me get into it a bit further) (& only right side – left side still nowhere near because of the ankle). But FIVE YEARS I have worked towards this and now I can do it !!! Also tried garbha pindasana – right arm through easily, which has never happened before, but then the ankle hurt when I tried the left. Doesn’t matter. Slowly. My right thigh still aches all the time, now that I am actually having to open the hip properly to avoid stressing either the knee or the ankle. But this is ok – I’m undoing damage that I carried around with me for fifteen years, I don’t mind if it takes a bit of time and hard work. The ayurvedic oil that Sharath recommended (Mahanarayan Taila) seems to help a bit. Things happen so quickly here. When I came, I couldn’t bind the right foot in half lotus at all without somebody helping me. The first week here I could, but I was probably doing it by cranking my foot into some weird position, so I hurt something in my ankle. Now within two weeks I’ve learned how do it again, but without doing anything weird with my foot, opening the hip properly instead. So ok, my thigh hurts a bit. But at home I would have expected it to take three or four months to get over something like the ankle-crunching incident. Here, three or four weeks. I am so happy here. Have been here a month now. Am making amazing progress in my practice, and love the atmosphere in the shala – very special yoga place. Have a pleasant home instead of a hotel room. Have some people who feel like friends, who I can have real conversations with instead of just banal yoga/traveller chit chat*. Have taken some decent photos and will take more. * Although, as Christina pointed when we had guests for Sunday lunch, there is no yoga student conversation that doesn’t cover the following subjects: what asanas you are currently struggling with and how to do them; what time you go to bed; what time you get up to practice and stair politics; what you eat and when you eat it; how long you are staying in Mysore; illnesses. Today’s practice – all lightness, air & freedom. Yesterday’s was all stiffness, pain & heaviness. Perhaps there is a reason for these things; perhaps there isn’t. Long weekend coming up – full moon Friday, and Guruji has to go to Bangalore for the weekend so no class Sunday either. Which is handy, because it means I can go to the harvest festival in Koorg on Saturday with a clear conscience instead of having to skive Sunday’s class.